For more than 10 years, the Japanese student volunteer organization IVUSA has been sending groups of students to India to participate in Embracing the World’s housing projects for the homeless and for disaster refugees. These students participated in projects to build homes for tsunami refugees in both Kerala and Tamil Nadu after the 2004 Indian Ocean Tsunami. And in 2010, after devastating floods in Karnataka, they helped to build homes for people whose islands had been entirely submerged by flood waters. Many of the volunteers have made several trips to India for this purpose. Viveka Koichi Kanematsu has been Embracing the World’s coordinator for these annual housing projects. 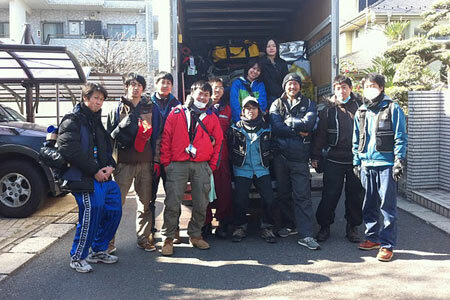 Now, after tsunami, Viveka is there in Japan organising relief works there. This is his first report. Leaving early this morning we drive for about 400 kilometers from Tokyo to Ishinomaki in Miyagi Prefecture. 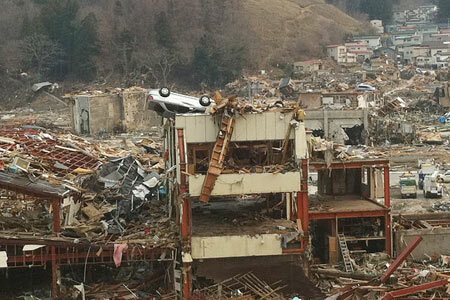 Ishinomaki was one the areas hardest hit by the tsunami. There are 16 members of us including 9 students going for the relief work. I know many of the group members from their trips to build houses in Amma’s projects in India. They are experienced disaster relief workers who I have worked with in Nagapattinam, the worst-hit area in India after the 2004 tsunami, as well as in Kerala, in Karnataka last year, and even as far back as 10 years ago in Gujarat after the 2001 earthquake there. When we draw near to the Fukushima Nuclear Plant, we put on masks and close the windows tight. There is a sudden quiet in the van. The beautiful, snow-topped mountains are almost blindingly white. It is still so cold in this area. The road is filled mainly with Self-Defense Force (SDF) trucks, ambulances, fire trucks–all heading north. Most people are wearing masks. In many places, the road is bumpy; the earthquake has torn up the tarmac. We stop for gas. At least 30 cars are in the queue ahead of us when we pull in; there is barely space to get off the highway. Fuel is being rationed—each vehicle can get only 13 liters of fuel.